One thousand Trees by Kyle Hughes Odgers | Educate.Empower. Where do you love being with trees? One thousand Trees by Kyle Hughes Odgers explores all of the different ways we can be with trees. Through simplicity, the reader can feel, smell, see, touch and hear what life is like and how we feel when we are near trees. 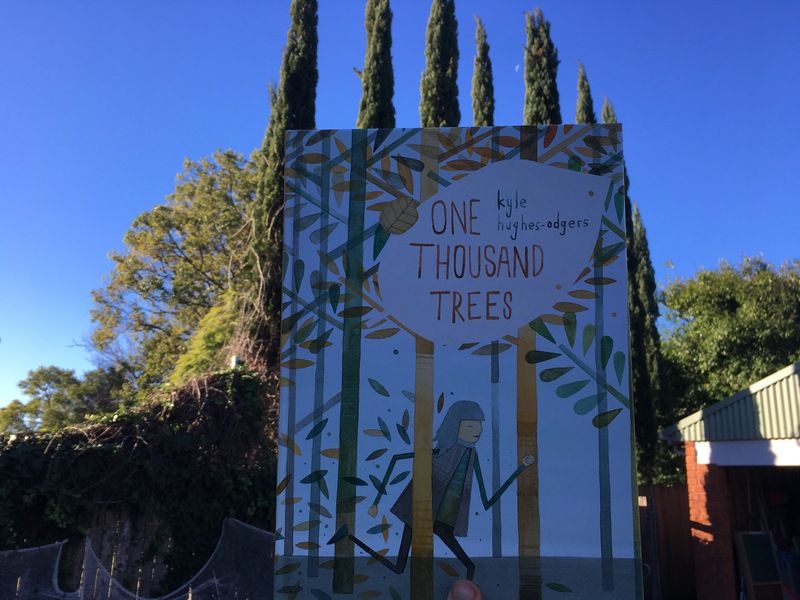 Kyle Hughes Odgers has used prepositions of place to climb to the tallest tree, walk among its branches and touch the textured bark. It leaves you feeling at ease and longing for a nearby tree. Many of us now live in cities and in apartments with little green space that has large trees to enjoy. In this story Frankie dreams of one thousand trees as he peers out over his city horizon – filled with grey buildings – not a sign of green anywhere. He dreams of how he can be among the trees and in his dream his body language almost immediately changes once the trees are around him. You may have heard of tree bathing? There is scientific evidence that being amongst nature can change how you feel and think and something that scientists recommend is done as often as possible. One thousand trees has had a calming effect on all the children I have read it to so I am sure that if we were all to talk a walk, at least once a week amongst the trees, we would all feel a bit calmer in this busy world! As you walk touch the plants, slow down and smell the flower, look closely for bugs and see the detail in leaves. Life is not a race – take the time to breath it all in. I like the idea of taking a tree walk once a week, at least. Trees are very calming. I look forward to reading this book. Pingback: National Tree Day – Educate.Empower.